How to Connect Two of This Speakers to Get 3D surround sound? 1.Full charging for the speakers' battery. 2.Press On/Off button to pen 2 speakers. 3.Choose one of speaker and press twice On/Off button. 4.Open your device's bluetooth function. Compact and Hook Design,Easy to carry or storage for Home and Outdoor. Metal body,Shockproof and dustproof.You will amazing about its amazing sound with tiny body. 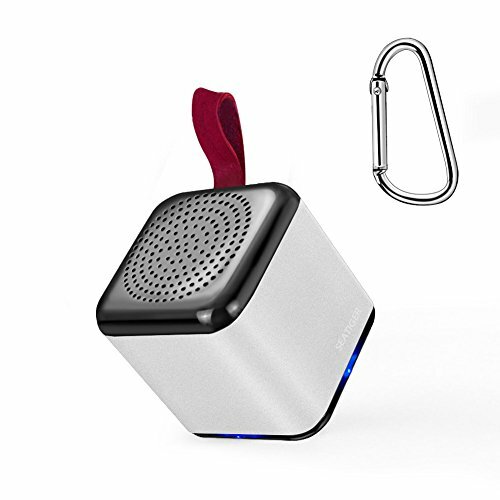 High Volume with Small Size: Tiny Body design, this mini Bluetooth speaker is super portable to carry inside your poket. The portable Bluetooth speaker with 3W output by high Sound speaker. Portable Sling - Hook the Compact Speaker Everywhere: The tiny speaker has a short red Sling with hook for hang it wherever you like, such as your hiking bag, bike, cars. Pair with other Speakers:Purchased 2 this speakers,you can experience 2 speaker pair itself via bluetooth to provide super high volume and best stereo Bass in home, outdoor or car. Easy to Pair: Bluetooth 4.1 pair function support iPhone, iPad, iPod, Samsung, Kindle, Android Phones, Tablets,just search and choose the speaker on your smart devices after open it. Full Satisfaction Services: Offering 6 Months Money Back Guarantee and 18 months warranty.We are sure you will amazing about its tiny size and high volume.Please feel releae to contract customer service about anything. If you have any questions about this product by SEATIGER, contact us by completing and submitting the form below. If you are looking for a specif part number, please include it with your message. AUCEE Wireless Bluetooth Speakers,IPX7 Waterproof Portable Outdoor Bluetooth Speakers with Bluetooth 4.2,Loud Stereo Sound, Enhenced Bass,6-Watts, Built-in MIC for Party,Beach,Biking,Car,Home(Black).